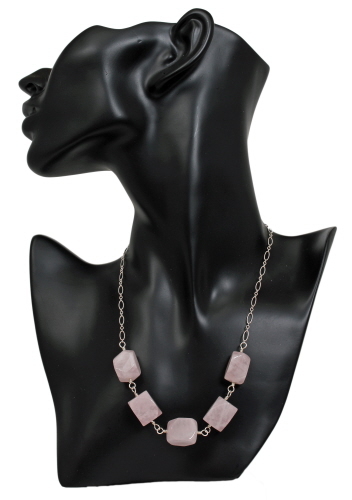 Chunky beads of rose quartz, measuring appox. ¾ of an inch in length by ½ inch in diameter, are paired here with a patterned long and short sterling silver chain. 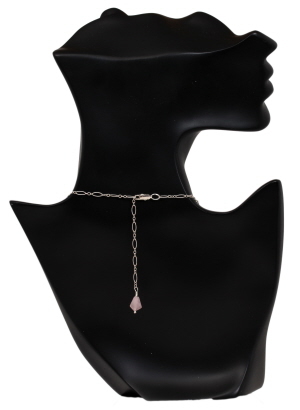 Necklace is adjustable in length, up to 19½ inches and weighs 1.6 oz. A dangle of rose quartz hangs down the back. Earrings are an additional purchase. 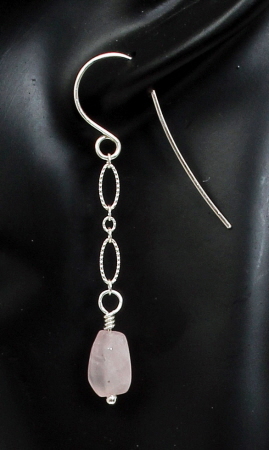 A rose quartz bead hanging from sterling silver chain. Earwires are hand formed using argentium wire. Earrings measure 2¼ inches from top of earwire to bottom of dangle and weigh less than 0.05 oz each.